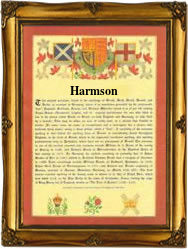 Recorded in the spellings of Harmston, Harmeston, Harmson, and Harmstone, this is an English post medieval locational surname, but of pre 8th century origins. It derives from the place name Harmston, a village five miles from the city of Lincoln, in East Anglia. The village name, first recorded in the 1086 Domesday Book as "Herneton", is a compound whose elements are probably made up of the Danish-Viking personal name "Hiarni" and the earlier Anglo-Saxon "tun", a farm or settlement. Locational surnames were usually granted to people after they left their original village and moved elsewhere. It was then, and is perhaps so today, that the easiest way to identify a stranger is to call him, or her, by the name of the place from whence they came, even though this was often only the next village! Examples of the surname recording taken from authentic surviving Lincolnshire church registers of the period include, Thomas Harmestone, the son of Henery Harmestone, christened at Bilton by Grantham, on February 19th 1595, and Thomas Harmson, the son of Michael, christened at Little Ponton, on March 19th 1606. The first known church recording is believed to be that of John Harmeston, a witness at Great Gonerby, Lincolnshire, on February 11th 1565. This was during the reign of Queen Elizabeth 1st, known as "Good Queen Bess", 1558 - 1603.